It's that eternal bit of Disneyland/Walt Disney World trivia that we can no longer escape. Everyone knows it by now. 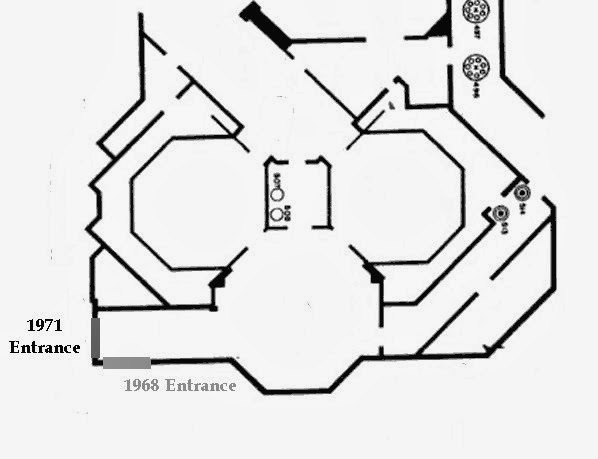 Even Steve Birnbaum put it in his earliest Official Guides, and it's given the unimaginative Walt Disney World tour guide slightly interesting material for lo these forty-two years: did you know that the stretching rooms in the Haunted Mansion go up at Walt Disney World and go down at Disneyland? Yes. We know. Everybody knows. I'm sure children have this fact implanted in their brains at birth by now. Where this factoid gains some life is when we inquire as to why the Stretch Room at the Haunted Mansion goes up instead of down at all, and most will readily respond: "oh, it's because of Florida's high water table!" Why? Well I'd first like to point out that Orlando, at the very center of the Florida peninsula, is in fact not at sea level. In fact, although Florida is indeed much nearer the water than many other parts of the country, Orlando sits a comfortable 90 feet above sea level. Yeah, that isn't much, is it. Still don't share my skepticism? 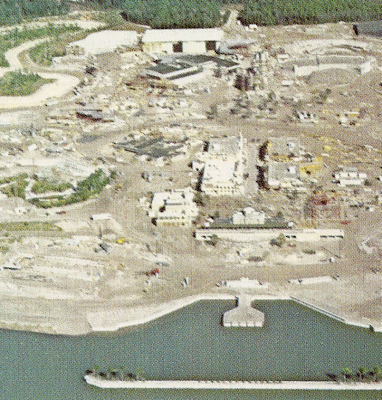 Well, let me then point out that the Magic Kingdom isn't built at ground level. 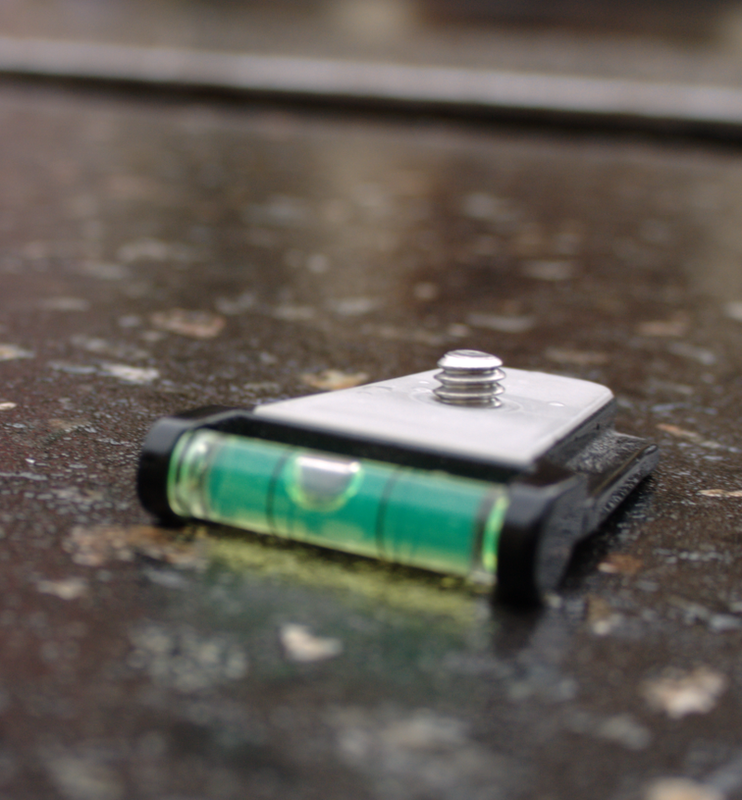 There's those famous Utilidors underneath it, remember? The Utilidors are built at ground level, and walking around Magic Kingdom is very much like walking on the roof of a building. So that adds another fifteen feet, and even if the Haunted Mansion's lowest foundation is about level with the Utilidor, its facade and entrance is nowhere near ground level. Fantasyland is located on a plateau high above the rest of the park to get that welcoming forward sweep of the walkway to the castle that John Hench wanted. 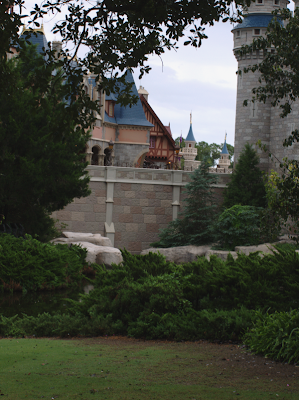 As the highest point in the park, this view allows us to directly contrast it with the lowest point in the park, which is the moat and Jungle Cruise. The height of this stonework wall is the vertical distance the park covers on pedestrian paths. To put it simply: the further south any one ride is at Magic Kingdom, the lower its elevation. The further north it is, the higher its elevation. 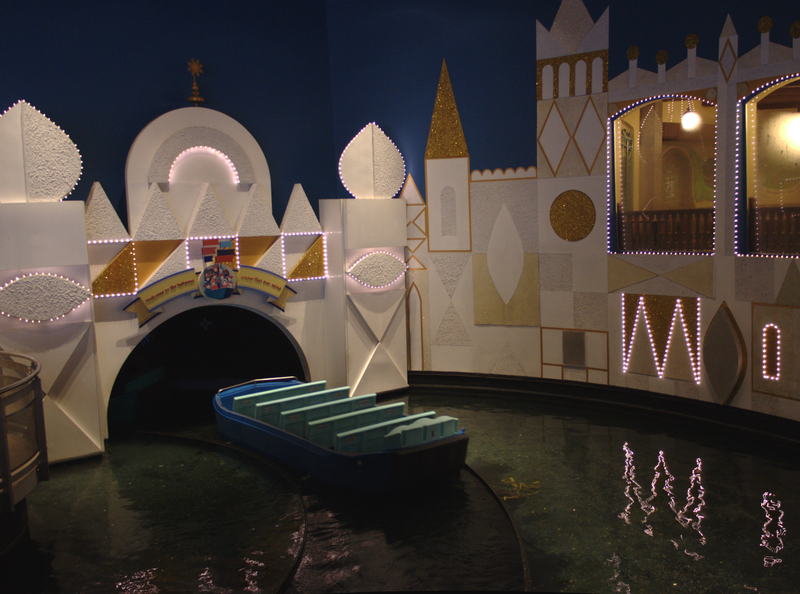 In 1968, WED Enterprises placed three attractions on the very northern edge of the park: The Haunted Mansion, It's a Small World, and 20,000 Leagues Under the Sea, and I do not believe that those choices were accidental. So, you ask, so what? So that old "water table" thing is just a myth, so what? Well, then why do the stretch rooms go up instead of down? Doesn't that still warrant an explanation? 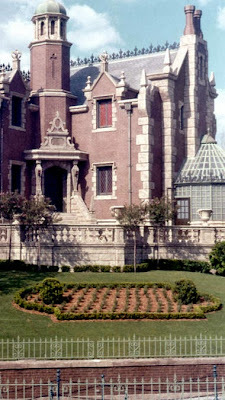 Think of it this way: the Haunted Mansion was, in 1971, still a relatively new attraction for Disney. They had just come off a ten year development cycle on it, and it had opened to a wild success at Disneyland. For Florida the plan was to make it bigger and better, but why would they bother to re-engineer the first major show scene? Wouldn't it make sense to simply replicate the original design, lift and all, especially since it was so successful and popular? And don't get me wrong: it's an entirely different design. 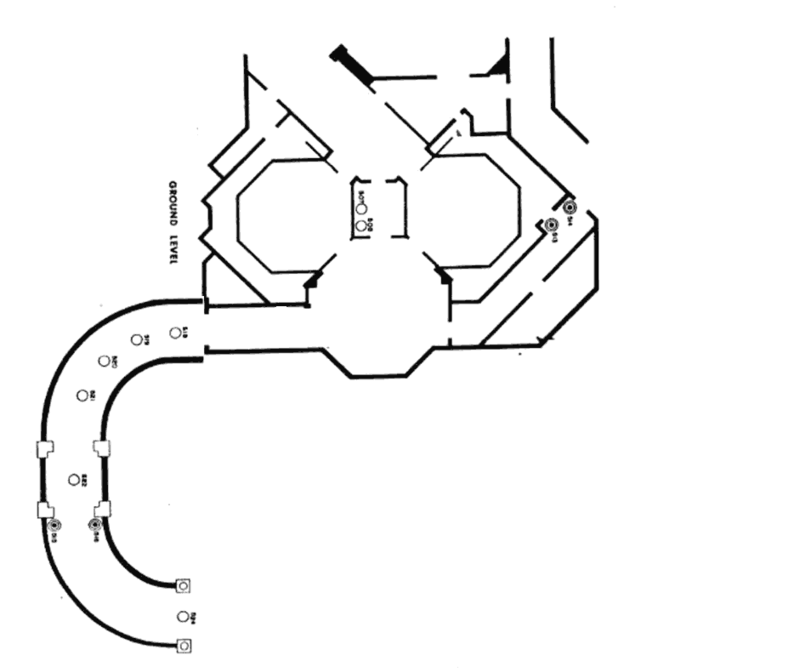 The Disneyland elevator room is a complex design like a telescope, where the rider car (the floor) pulls the walls down in three distinct stages. At Magic Kingdom, the whole thing is basically run on ropes and pulleys. Although it looks impressive on stage, the operation is actually fairly quaint. It's more like pottery making apparatus than a special effect. And all of this was being done post-haste. 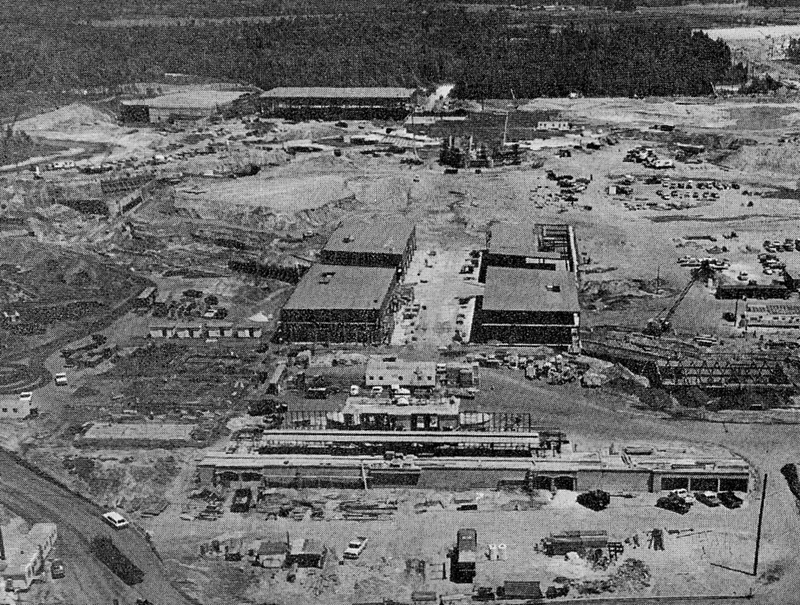 The entirety of WED was deep into planning and building the Magic Kingdom by 1968, and the Haunted Mansion was "cloned" nearly immediately. Consider this: when you're watching Disneyland Showtime, the famous Disneyland episode where Kurt Russell takes us behind the scenes of the ride, what we see being constructed is the Walt Disney World Haunted Mansion at WED in December of 1969 - the special aired in February 1970. 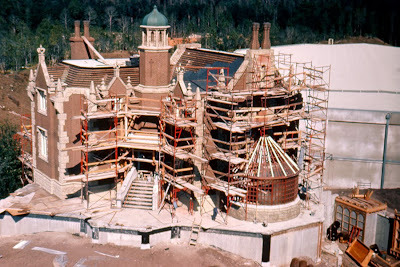 In most photographs of the Magic Kingdom under construction, Haunted Mansion is the furthest along, and in fact reached the finish line first. She was ready to go. Wouldn't the abbreviated schedule be an additional incentive to replicate the elevator? Was that ever the original plan? Let me introduce you to the Haunted Mansion that was almost built. 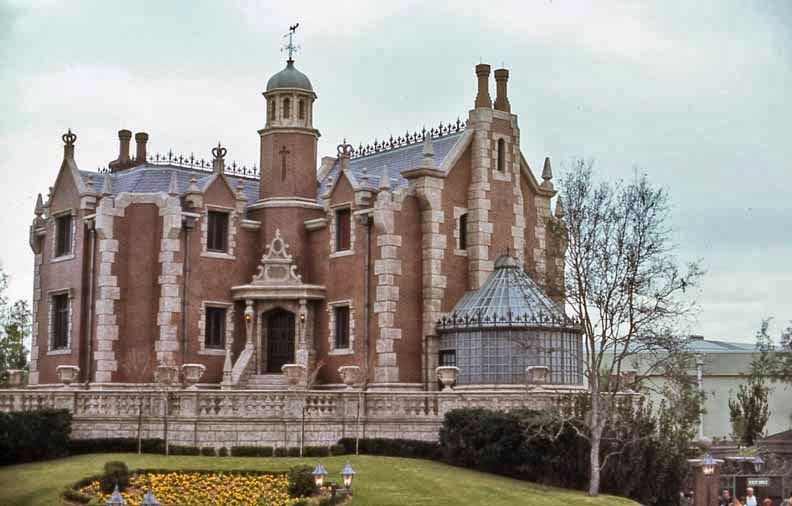 Have you ever noticed that Disney likes to localize the Haunted Mansion in upstate New York, specifically in the Hudson River Valley and typifying whatever "Dutch Gothic" is? This is probably because this open, wooded region has deep Americana associations with Sleepy Hollow and the headless horseman, but the house itself really doesn't seem to visually reflect anything specifically New England or upstate New York. It's more Old World than Old Cider Barrel. I think the Hudson River Dutch Gothic name-drop began very early in the pre-planning for WDW and was simply never really weeded out. Let's unpack this for a moment. 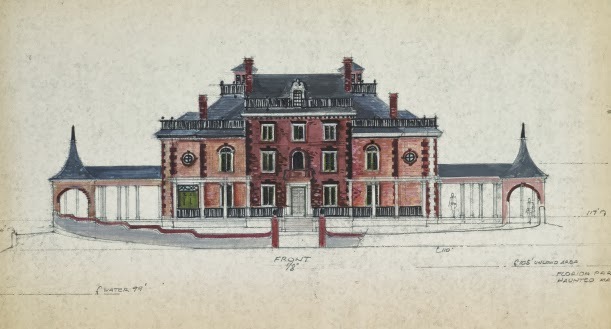 For one thing, a Dutch colonial mansion would've necessitated an estate built in the early seventeenth century, a full two-hundred years ahead of the Gothic revival house we got. 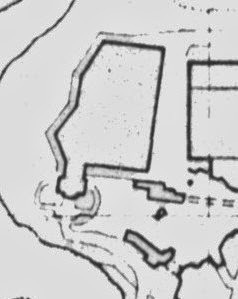 And since practically nothing of the original New Amsterdam settlement remains, I think we can disqualify anything specifically "Dutch" about Disney's intentions - it's just an evocative phrase, meant to summon up an old house in the oldest part of the country, the Hudson, which flows out to sea at the port now known as New York. Trying to chase down the Dutch connection is a fool's errand. We're simply in the wrong style and wrong period. And while I'll bite into Gothic Revival more fully a bit later, it's worth keeping that question mark about Disney's old phrase lurking in midair just long enough to suggest that, in our minds, I think we're meant to think of the Mansion as built, with its widow's walks, tower, and proximity to the Columbia Harbor House to be more of a grand seaside horror mansion in the Cat and the Canary tradition. Imagine it atop a rocky buff with the crashing waves of a midnight storm lashing the coast below. "Upstate New York, eh? Come inside for Buffalo Wings!" Of course, Hudson River Valley could still work. 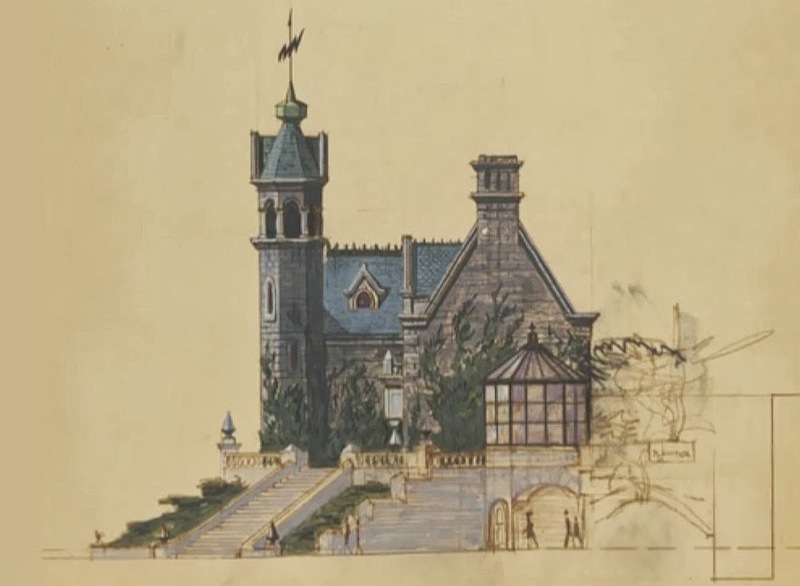 Disney amusingly built a near-perfect replica of Sunnyside, the estate of Washington Irving, at the front of Liberty Square and called it Sleepy Hollow Refreshments, so somebody was doing their Hudson River Valley research in WED. 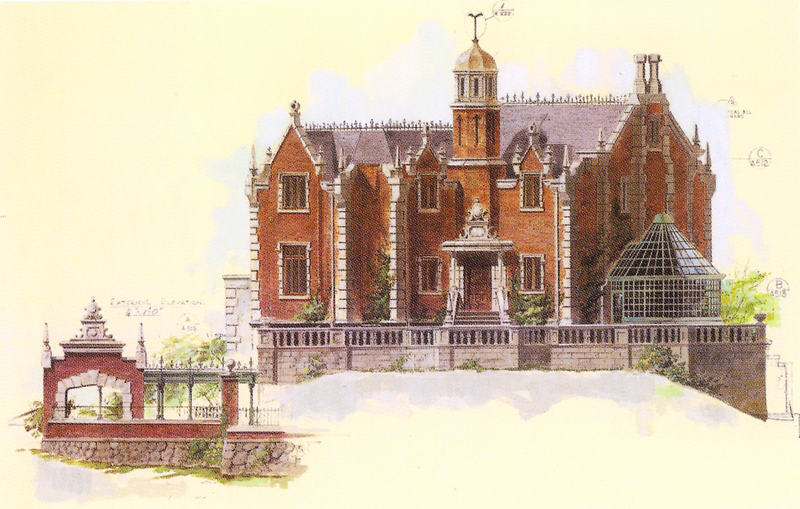 I think it's fair to say that the Haunted Mansion as we have it isn't traceable to any one specific visual source - in the way that the Hall of Presidents is modeled on Indepedence Hall, for example - and is more of a fantasy creation. 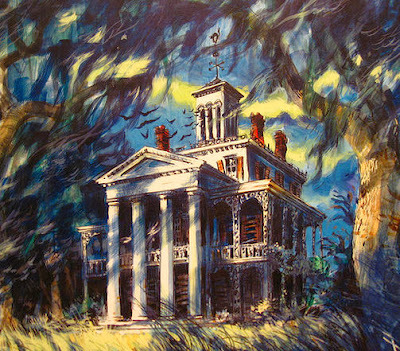 As far as I know this piece was not widely known as being a painting of the Haunted Mansion until 2003, when it was published in The Haunted Mansion: From the Magic Kingdom to the Movies by Jason Surrell. In that book Surrell seems to brush it off as an unrealized concept, but this concept actually came very very close to reality. And notice: there are guests gathering outside on the porch and being let in through a door in the facade, exactly like at Disneyland. This requires a house on a hill and an elevator. 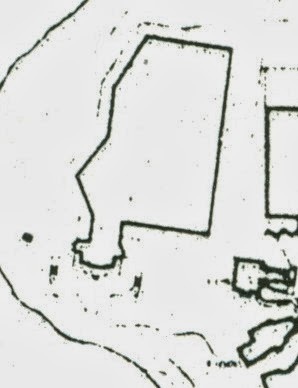 Disney had foundations for the Mansion laid in 1969 - among the earliest work done on the Florida property, since it could be done at the same time as the start of the Utilidor entrance. In most construction photos of the Magic Kingdom, which is to say most photos published where there's something to look at, you can see the Haunted Mansion show building sitting there all set - except for the facade. In Florida they did the opposite of what was done in California - they built the ride first and the house last. Facade finally goes up as the park rises. Assuming that the interior show was ready to go out of WED in Glendale in the first few months of 1970, the interior "show finish" - animated props, set surfaces, ride track and all of that - would've been ready by mid 1970, a date which is supported by Tony Baxter's recollection that the Haunted Mansion was basically ready a full year ahead of schedule. Given this time frame, isn't it suspicious that they waited so long to build the facade? Please expand that and note that there is a separate notation for the elevation of the unload area at the bottom right. As built, the WDW Mansion enters, loads, unloads and exits on the same elevation. I'm somewhat hazy on how a double-sided operation would've worked here, because there's only one entry door - it's the green door on the left side. Still, the 1971 turnstile shelter and curved holding area are well designed, even if they're no longer used as intended: the holding area accommodates exactly 90 people, which is the idea load size for both the Foyer and Stretch Room. All the ticket takers had to do in 1971 was to fill the holding area, stop the line, allow the group to clear the holding pen, then fill it again. There's a few other nice details about this 1968 facade. Notice the two cupolas on the roof - one for each Stretch Room. We can see the entrance columns for the "Haunted Mansion" plaques down in front and, one assumes, gate and fence, as well as a sloping front lawn leading up to the doors. 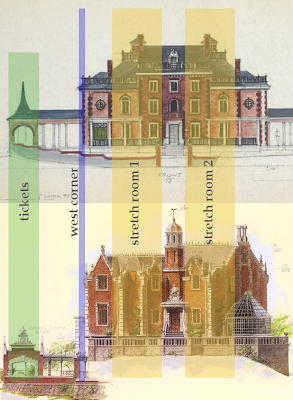 In short, this would've been very much like the Disneyland Haunted Mansion's entry and queue, which was at the time these plans were drawn up being reworked to add additional queueing capacity. The overall visual tone, however, is very close to what was built - Dutch cornerstones, red brick, lots of stone, slate roof. There's just a few too many trellises on the roof for comfort, and those sharp spires on the entry ways look violent. Even more tellingly, every window is shuttered... this place is creepy. It's only slightly creepier than the Disneyland facade - about 10% on the sliding creepy scale - but enough to look seriously intimidating. What's interesting is that when you get right down to it, the layout has not been altered at all. Try lining up both elevations to compare; how different is this, in reality? I think what happened is that once Claude Coats knew he would have to re-design the facade to sit at the same level as the load area, he simply transposed the layout down. The second ticket and holding area would now be useless as well as in the way of the exit door, which would now sit at the same level as the entrance door, so he got rid of it. 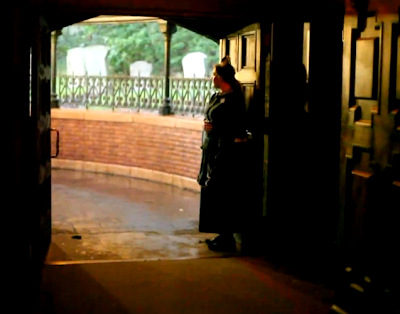 In fact, the biggest change is that the entrance door now faces west instead of south - it's in the exact same spot. 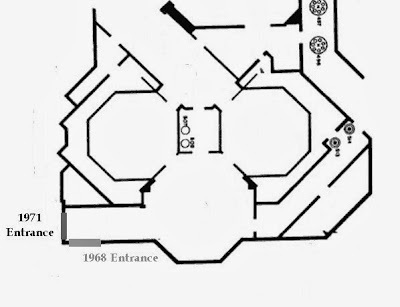 What's interesting is that the placement of this door in a darkened antechamber next to the main foyer area shows just how little the layout was altered. 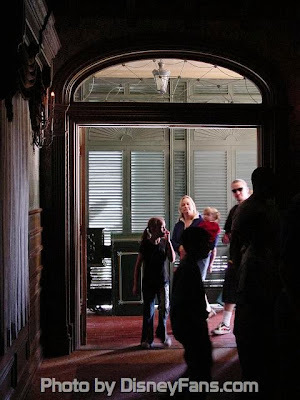 Disneyland has always allowed a little bit of daylight into their foyer, although as far as I can tell the shade structure enclosing the porch around the door has always been there to mitigate it somewhat. This is not a problem because there are no special effects in Disneyland's foyer. Florida seems to have always had the Aging Man effect intended for a fireplace between the two Stretch Rooms, and daylight would very much compromise the effect if the foyer were arranged similarly to Disneyland's. This goes double for a facade built up on a man made hill in the harsh Florida sun, facing south, where rays could easily enter in the afternoon. 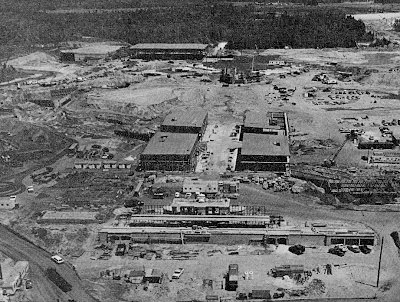 Walt Disney World's door ended up being buried between hills, facing west behind a stand of trees, making that short hallway somewhat unnecessary, but it remains to this day - a small echo of what was once intended. All of the preceding establishes that time was very much compressed in all of this. 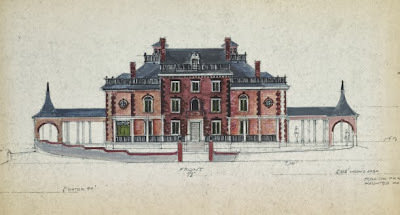 And although we thankfully do have a fairly complete idea of what Coats' creative process was in arriving at the final design for the Mansion, I feel that a key piece of evidence has been somewhat under-represented in Mansionalia circles, so it's time to take a good, long look at Decorative Art of Victoria's Era, by Frances Lichten, published in 1950 by Bonanza Books. However I was slow in obtaining a copy of the book myself for many years. Figuring that the best of it would already be known, I was finally motivated to get my own copy - partially out of motivation to improve on the low quality scans of the book - in preparation for this article, only to find, as usual, that having the book in front of you changes things quite a bit. 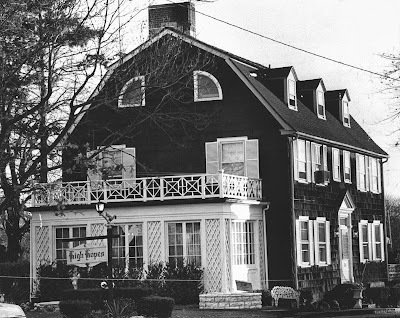 Now, to be clear, there aren't many "smoking guns" to be found in this book, and nothing on the scale of that Shipley-Lydecker house photo, a completely unambiguous "gotcha!" moment. Still, after spending time with the book, I am firmly convinced it was a major reference guide for the design of the ride. Lichten gives clear explanations of the reasons why the Victorians lived the way they did, and follows up with copious illustrations, giving instructions on everything from furniture to chandeliers, wallpaper, and window hangings. There is an entire chapter on graveyards. Another section of the book carefully details the Victorian cross-stitch "motto", and Lichten's precise instructions on the floral border and type of frame are carefully followed for the famous "Tomb Sweet Tomb" sampler - since I don't know of any art for this particular detail, I'm inclined to believe it was inspired by Lichten's book. This illustration appears as part of a chapter detailing the Victorian fascination with the medieval as derived from the poems and writing of Sir Walter Scott, especially Ivanhoe. 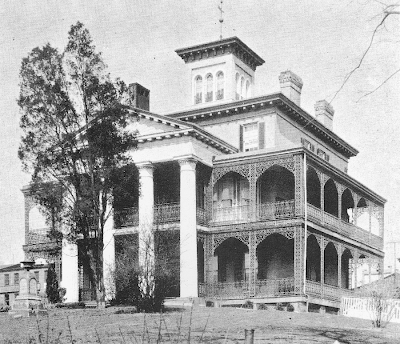 Finding a parallel in the (then) modern fascination with Antebellum style and decor sparked by the success of the film Gone With the Wind (1939), Lichten traces the Victorian development of what we now call Gothic Revival and what it meant in its own day. Now, call me picky if you like, but prior to obtaining this book, I considered the above only a pretty likely inspiration. 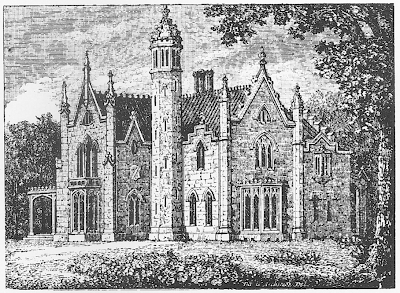 With better detail now visible, it's easier to make a case for certain details of the Mansion... that chimney is darn close, as are the peaked roofs, gables, and even the Gothic cross on the central tower of the Mansion can be derived from this engraving. But what a scanned image can't convey is what sold me on this being the clear, unambiguous source for the Florida Haunted Mansion, and that is the text surrounding it. As I studied the book I felt like I was there with Claude Coats back in 1970, becoming increasing convinced that this was the correct route to take. Despite the scarcity of good architects, the taste for the new fashion developed quickly in the United States, and by the 1830's there were many examples of the style. The Gothic was thought to be particularly well suited to the American countryside - a region characterized by the "wilder, romantic and more picturesque country where the hand of man has been only partially laid on the forest. This type of terrain," says A. J. 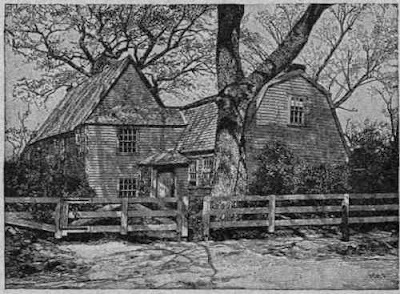 Downing, the greatest American arbiter of architectural taste in the first half of the eighteenth century, "supplies the appropriate background for a style which sprang up among the rocks and fastness of Northern Europe." Mr. Downing's affection for the Gothic was responsible for innumerable example of the Old English cottage, and of residences of the Castellated style, as the domestic specimens imitative of castles were then called. Like mushrooms, the popped up on every hill in the more cultivated regions of the country, for country estates were then a fashionable indulgence, and the Gothic, the only style then considered appropriate for rural living. In 1836, a traveler, describing his initial train ride on New Jersey's first railroad, indicates the early flowering of the taste: "Our ride to Philadelphia over the Camden and Amboy Railroad and up the beautiful Delaware was truly delightful, especially the latter. 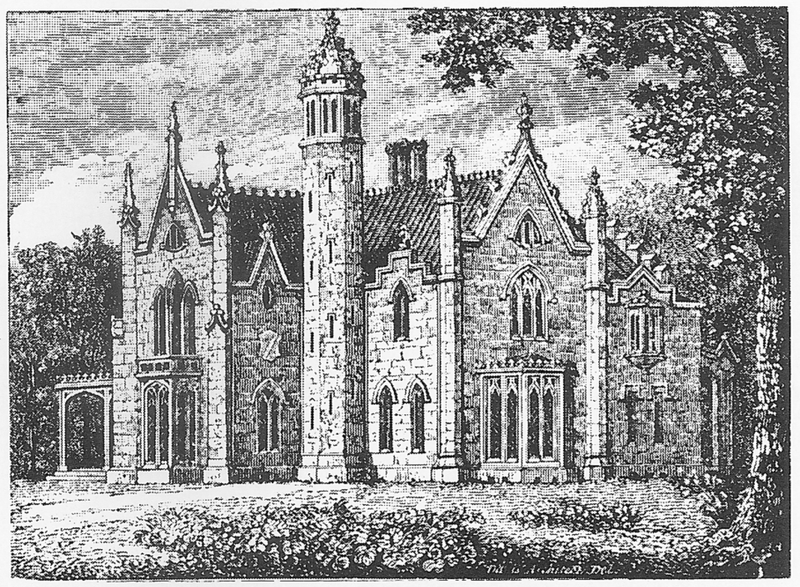 New and beautiful scenes continually opened to view - with fine country seats, built in imitation of Gothic castles, with towers and battlements standing amid a fine growth of trees of every kind..."
As the nineteenth century moved into its sixth decade, the craze for the Victorian Gothic house must have reached its utmost in absurdity, for we find it dealt with by the writers of the day. James Russell Lowell accepted the challenge offered his pen by the sight of a ridiculous wooden castle, set on an unshaded, mathematically squared lawn patterned with flower-beds of equal geometric perfection. 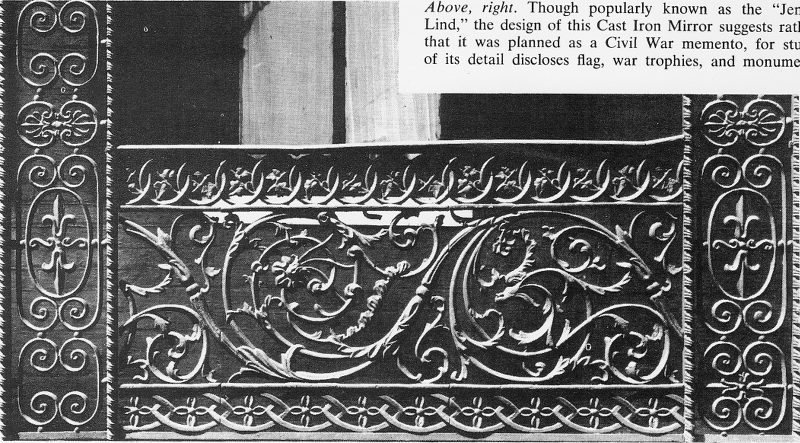 Designers for [wrought iron] brought out patterns calculated to attract the eye of the romantically inclined. No longer need the owner of a new Gothic mansion enclose his velvety lawn with anything so commonplace as a white picket fence. 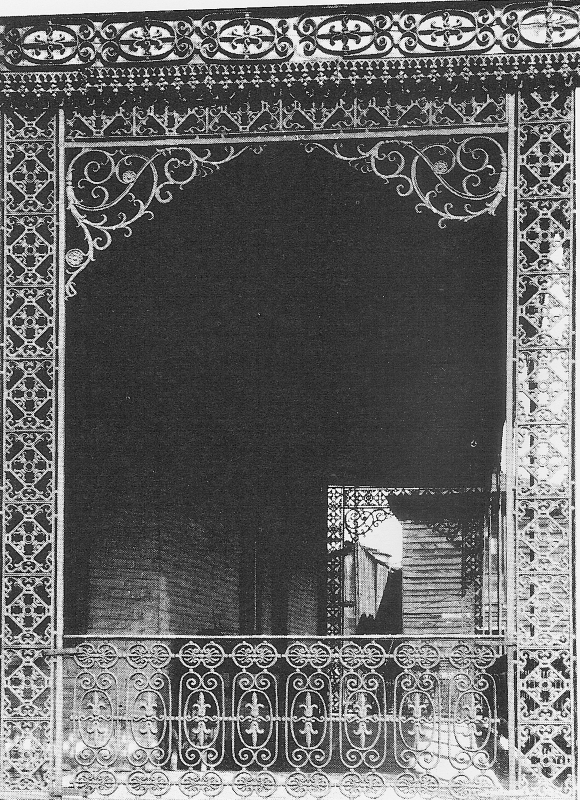 Now he could purchase fanciful wrought iron traceries, as Gothic in detail, if not material, as that of the most ornamental of ancient stone or wood carvings. As additional medieval garnish, the foundry men stood ready to supply porches and verandas patterned in formal Gothic trefoils or qua-trefoils, as well as garden pavilions - the latter affairs being frivolous counterfeits of the flamboyant traceries of a cathedral window. Over these lacy structures, the Victorian maidens coaxed vines to grow, to simulate the antique arbors of their sentimental reveries. And if the solemn English ivy, accustomed to a support of honest stone, refused to clamber over a deceitful edifice of iron, the light-minded native vines were found to be more accommodating and made quite as satisfactory if less poetically evocative green draperies. "Many examples of the Victorian Gothic residence are extant, both in city and country districts: the substantial stone and stucco mansion as well as the wooden farmhouse and cottage, their eaves still supporting the remnants of the once-so-fashionable edging of wooden lace. 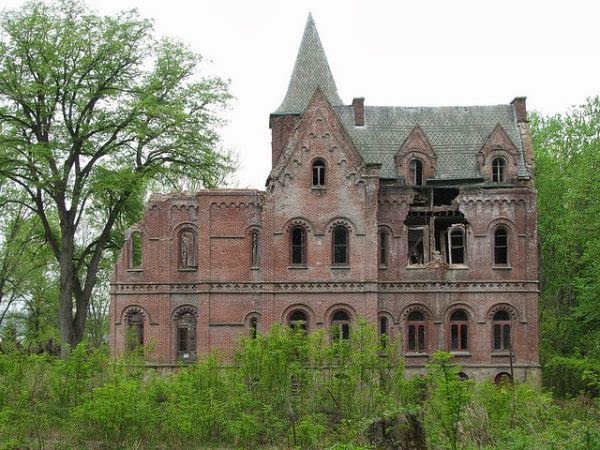 Where the battlemented stucco castle stands deserted, once trim trees and shrubs crowd the jungle-thick, and push exploring fingers through broken windows of many-colored glass. In the dark of the moon, fog drifts about the ruined toy-like turrets. Morayama's or Arzelia's bower is given over entirely to bats and rubble, and the thrust of strong vines has pushed apart iron traceries. In truth the decaying structure conveys to the present-day observer the same sense of horror and mystery that the medieval ruin conveyed to the popular mind. Lacking the patina which the mellowing touch of time and nature give to the ruins of the middle ages, the abandoned Victorian Gothic domicile, its shoddy fabric disintegrating before one's eyes, has today become the artistic and literary symbol of "the haunted house". I think this is likely a half-measure, although I do like the steps up to the facade from ground level. 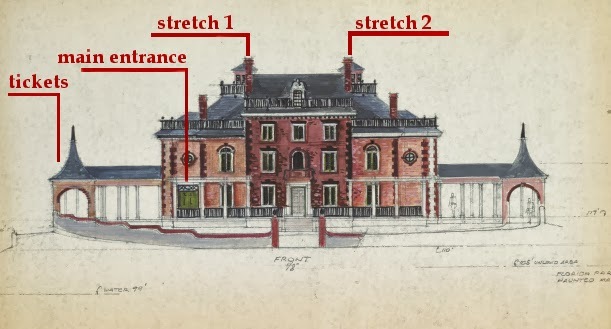 By early 1970 the Gothic Haunted Mansion with the raising stretch rooms was being assembled on-site in Florida and the Federalist facade would be forgotten for over three decades. The only thing that's missing from this narrative is the reason why, during construction of the ride, in early 1970, the original plan was abandoned, and the simple answer is that I don't know and I'm not sure if we will ever know. If you're a long time reader of this blog then you'll know that I love to return to that eternal question of why the Haunted Mansion is in Liberty Square, and I've spent tens of thousands of words justifying it conceptually and artistically. But here's the likely, final reason: they wanted to put it on the north side of the park where it would be properly elevated so they didn't need to even worry about Florida's high water table. I really think that's it. Say what you will, but the Magic Kingdom was an impeccably planned project. I still believe that what we are looking at here when we corral all of this evidence and all of these schematics is some sort of remnant of a technical gaffe. When you are building a theme park, you don't want to go doubling back to re-engineer a problem you've already solved, which is what Coats was having to do here. He had lots of other stuff on his plate which also had to be ready for October 1, and his friend Marc Davis probably wasn't even involved in the 1971 iteration of the ride. 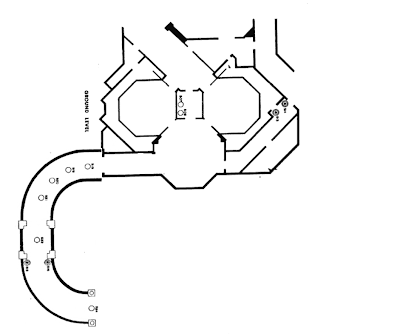 Simply put their initial plan was the obvious one: repeat the elevator, exactly as it is at Disneyland. What stopped them? "The [Haunted Mansion] finally opened six years later, then briefly closed. 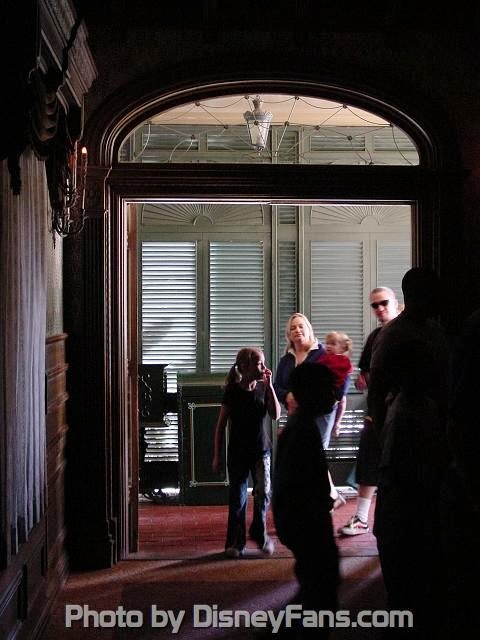 To lower guests so they can walk underneath the railroad tracks to the main show building, the Haunted Mansion uses a pair of elevators. But, about six months after the ride opened, the elevators stopped going down. Somehow, water had seeped into the elevator pits and caused the lift mechanism to fail. By putting green dye in the water, repair workers were able to trace its source to the Rivers of America. Maintenance pumped the entire river, then resealed the elevator pits." Six months after August 1969 puts us exactly in February 1970, which is slightly before the facade of the Florida ride was redesigned to ditch the elevators. If this is a coincidence, it's one that strains credulity. Sadly, I have no information to back up this story, nothing in Disneyland Line, nothing in Los Angeles area newspapers, and most of the memorandum of that era was long ago destroyed and so is not on file at Disney. 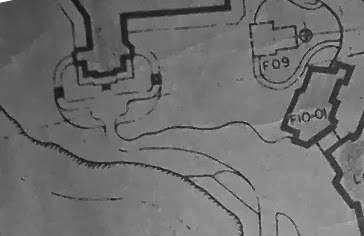 Originally, the Rivers of America at Disneyland were lined with mud. Today, they are lined with concrete, and I don't know when the concrete came in - whether in 1970 or some later date. 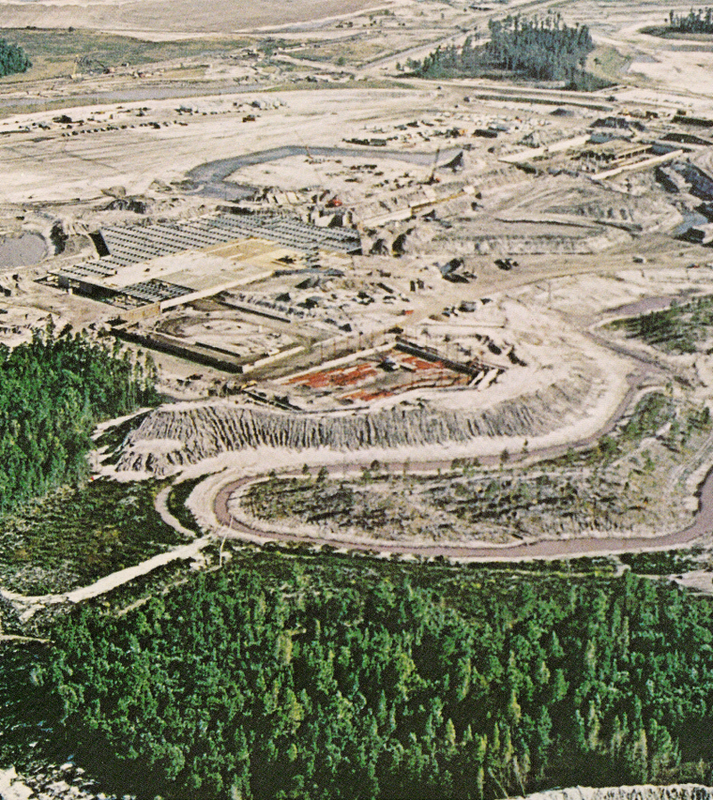 The Magic Kingdom's River has always been concrete, and I'm going to assume that it was the intent from the start, as Florida's sandy soil would likely sucked up any clay lining Disney would've put down. Did the water leak spook the designers of the spooky house? Having to close your attraction after only a few months to reseal elevator pits after weeks of misfiring effects and years of development may have just been the thing to do it. 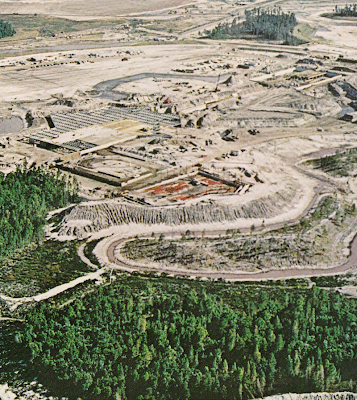 And if that's true, then there's an irony lurking behind all of this: for all my complaining and railing against the water table pat explanation, it may be true -- not Florida's water table, but Magic Kingdom's.